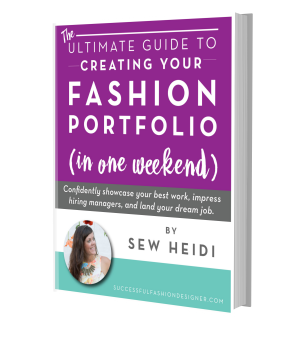 What do employers expect to see in your fashion portfolio for job interviews? By now, we’ve gone through so many details about what to put in your fashion portfolio, this is pretty much covered already. But during my research phase and talking to over 100 fashion designers about their portfolio questions, this one came up over and over and over. So for that reason, I’ll address it on its own, even though some of this may be redundant. And how do you do this? Again, much of this is repetition, but we’ll go through each one in detail. Mentioned before but worth repeating, make sure you know who the competition is and that you’re paying attention to them too. Now, if you have some projects that are close to their aesthetic but not a dead ringer, that’s ok. 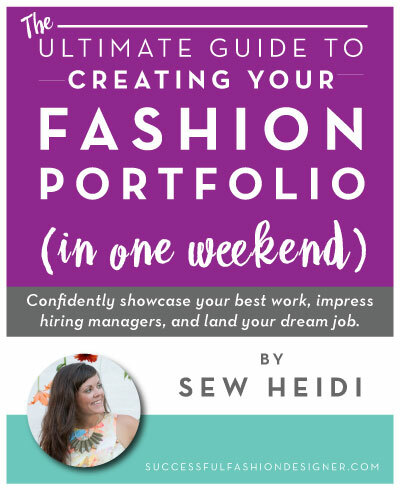 If your work is in the same general category, your digital fashion portfolio is probably enough to get you a job interview. When you go to the meeting, it’s probably in your best interest to make a few small edits to your physical book to really make sure you connect with them. Use the trick I swiped from one of my readers, Filiz, that we talked about earlier and update just one or two designs in your book (always use removable tape!). Pull something prominent from their design aesthetic and figure out how to incorporate one or two pieces into your portfolio to show that. Maybe it’s adding lace or studs to a garment. Maybe it’s a paisley print or stripe because those are staples for their brand. Whatever it is, this is where you need to use your eye as a fashion designer to figure out what would speak directly to them and figure out how to incorporate it. This should be clear in your work. It may (again) mean swapping out a few key pieces in your book if you haven’t updated it in a while. This is HUGE. They will know you are looking at the same stuff and boom, just like that there’s a connection made. Simply put, this comes right back to The Process Portfolio. Show at least your ideation (moodboards, sketchbook pages, etc) and flats sketches. Beyond that, you can incorporate hand sketches, illustrations, tech sketches, and finished product photos if you have them and as appropriate for the job / brand. As we already discussed, if the brand is small and your job would entail design + tech work, showing tech packs is probably a great idea. If they’re high fashion and illustration or hand sketches are important, include that. 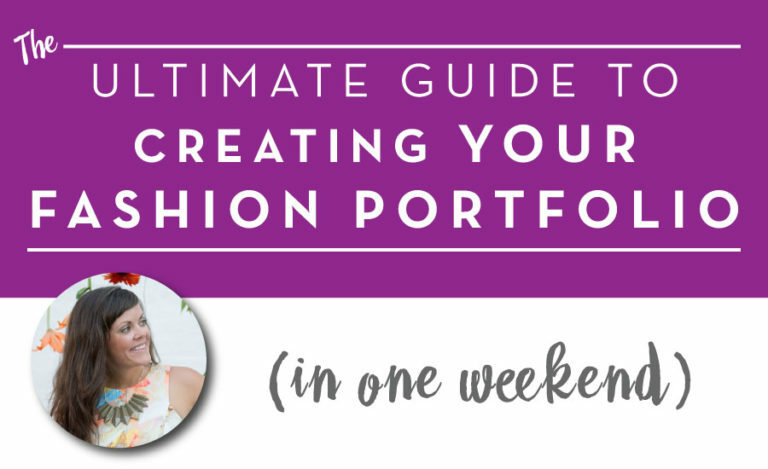 Remember, your fashion portfolio is (unfortunately) not one size fits all. It’s an art, not a science. Adjust accordingly based on who you’re interviewing with and what the job expectations are. The extra time investment in doing some small customization for each opportunity will increase your chances 10x. When looking for fashion design jobs, how can you anticipate individual brand’s expectations and meeting them? After following the 3 tips we just outlined above (understand their design aesthetic, stay up to date on trends, and know the design process) there’s no magic answer to this. But, there are a few things you can do to be more prepared than the average person. If you’re working with a recruiter, you have the advantage of getting an inside scoop. Use their knowledge of the brand and the expectations of the hiring manager to make sure you show up prepared. If you’re applying through a company website or blindly pitching for freelance work, go in as prepared as possible. This is going to mean you review the job posting and requirements carefully and make sure to address each point in your resume / email / cover letter. When it comes to your fashion portfolio, this may mean sending a few tech pack samples in addition to just showing the design work on your website. Let me tell you, I have hired before…and it’s UNBELIEVABLE how many applicants copy and paste from one job to another. If you spend the extra 30 minutes to send a slightly customized application and show that you’re paying attention to their needs, you will already by in the top 10% of applications. Beyond this, you can just ask! Depending on where you are in the application / pitching process, this may happen at different stages. If you haven’t yet applied and happen to see that a mutual connection on LinkedIn works there, it can be worth reaching out to ask them for advice about what the brand expects. If you’ve already applied and got to the interview stage, this could mean asking what they would like you to bring. But before you blindly ask and expect them to deliver you an answer on a silver platter, do your homework and go in prepared. Because you want to know a little secret? Most people are happy to help you as long as you’ve shown you’ve already tried to help yourself. So, what does this mean and how does it apply to anticipating an individual company’s expectations? WOW! As a hiring manager, I am already THRILLED that you want to make sure you not only anticipated my desire to see tech packs (just by paying attention to previous correspondence or the job description), but that you also care about being prepared. It’s TINY things like this that add up and make a HUGE difference in who gets the job. That said, use your judgment and eye as a fashion designer to make edits as necessary. If a full season is a huge assortment of 24 pieces, it may not make sense to include everything. It’s a lot to show can crowd your portfolio. Pick the best items you feel show your design aesthetic and speak to the brands you’re going after, and showcase a cohesive but smaller assortment. If there was a piece you hated but stayed in the line? Drop it! If there was a piece that got dropped but you felt was really strong? Keep it! You are in control, and your goal is simply to show the brand you get them and can design into their aesthetic. Again, there’s no magic answer or number to how many pieces, it’s your job as a fashion designer to pick the best grouping that’s well rounded, speaks to the brand, and shows your design aesthetic. Conceptual versus commercial can depend on the brand. If it’s high fashion and cutting edge runway styles, conceptual will most likely be best. But most brands fall into the commercial category, so you’ll want to showcase your work accordingly. The work and designs you include should be relevant to them, so if they’re commercial, your fashion portfolio should represent commercial. And as far as designs going into production / stores? Overall, I don’t think it matters a ton. Of course it’s important to show some designs that did make it to production (if you’re at the point in your career that you have that), but it’s also ok to include great work that didn’t make the cut. I say this lightly and leave it up to you as a designer to balance your book. If you have 10 years of industry experience, use your common sense and don’t show only self directed projects or just designs from your own “little” fashion brand. The point is, it is acceptable to show pieces that didn’t go into production (which many of you had questions about).